This site was originally designed to provide a complete pictorial guide to all the butterflies and dragonflies known to be found on Koh Samui, with additional sections devoted to my travels around Asia and the species of butterflies seen there that have NOT been found on Samui (yet! ), and also a selection of other insects from Samui, which can be found in the Galleries section. During 2011, I was introduced to Antonio Giudici, who is a resident of the sister Island of Koh Pha Ngan, and who had just started photographing the butterflies of that Island. 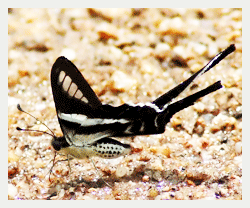 It soon became apparant that there were several species found there that had not, yet, been found on Koh Samui. As these two Islands are only a 30-45 minutes boat trip away from each other, and are the two main tourist Islands of the Anthong Archipelago, it seems sensible to include Antonio's findings in this site. I am deeply grateful for Antonio's co-operation in allowing his photos to be reproduced here, and for providing full information of what has, so far, been found there. There has been little work done on the butterflies of the Islands. This is a shame because of their position, near the meeting point of two large separate faunal areas is interesting. The Islands lie near the Isthmus of Kra, where, 20,000 years ago, there used to be a sea connection between the Indian Ocean in the West, to the Gulf of Thailand in the East. The insects north of this divide were of Indo/Chinese origin, whilst those to the south belonged to the huge area known as Sundaland, which today comprises of Peninsular Thailand (below 11°North), Malaysia, Borneo, Indonesia, east to Bali, and the Philippine island of Palawan. Since the sea gap was closed, there has been the opportunity for the two species groups to mix. In this section, you will find small galleries of selected photos of the remaining insect groups. These galleries are in no way meant to show the entire number of species found on Samui, and, in many instances, the species remain unidentified. The moth galleries show Samui species only, but the other, smaller, galleries will show species found during my travels. These species are clearly labelled as such. If anyone can help with these, please contact me. I would be most grateful. This section is where you will find photographs and information relating to all the known species of butterflies found so far on the Koh Samui. By clicking on the particular butterfly photo, you will be given additional information relating to that species, including wingspan, period of flight and flight range. There has recently (2012) been a very heated arguement on how to calculate 'wingspan'. For the purposes of this site, 'wingspan' is the distance between the apex of each forewing on a normally set butterfly, where the forewing dorsum is at 90% from the thorax. Unfortunately, there are occasions where I have to use techical terms in describing a butterfly. For details of these terms, click here. Where known, information of their early stages will be provided, where ever possible as a direct link to existing information on the web. There is also, in the 'Insects' section, a complete list of all butterfly species found in Thailand, with links to photos where found. Finally, there is a photographic list of all the Dragonflies and Damselflies recorded from Samui. However, detailed information of these is not provided, as my knowledge of this group of insects is very limited. From time to time, I travel away from Samui and in this section you will find photos of butterflies I have come across during my trips to other parts of South-East Asia. Only species NOT found on Samui are pictured. There is a full list in alphabetical order, of these species (double click on 'expeditions'). This shows where I have come across them, and under which part of this section you will find them, so you can either see all the species from a particular country/area or, alternatively, you can click on the species name to see the subspecies of each individual species I have managed to photograph. Notice of new additions and details of my trips will be advertised in my Blog, as I describe my recent entomological experiences. Wherever possible, I am trying to provide photographs of live specimens, and also give further information which may be useful to the visitor. ALL PHOTOGRAPHS REMAIN THE COPYRIGHT © OF LES DAY, UNLESS OTHERWISE STATED. If anyone has any missing information and/or photographs, please let me know. All contributions will be duly recognised on the site. The Butterfly Circle : (in no particular order) Khew SK, Frederick Ho, Sunny Chir, Anthony Wong, Simon Sng, Ben Jin Tan, L C Goh, Horace Tan, Sum Chee Ming, Koh Cher Hern, Monique Simons.